Bring your own tent, chairs, table or rent ours. We provide your 10 x 10 tent, 8' table and 2 chairs. We will place you with another vendor. Make a non-refundable deposit to reserve your space at this price point now. Final payment due March 18th 11:59pm PST. We'll help you level up and prepare for the festival before you even begin. Open to all ages this event is FREE to the public. where ages 12-17 will have an opportunity to exhibit and share their talents for the first time. If you know a young artist who would be interested please contact us or share this information. 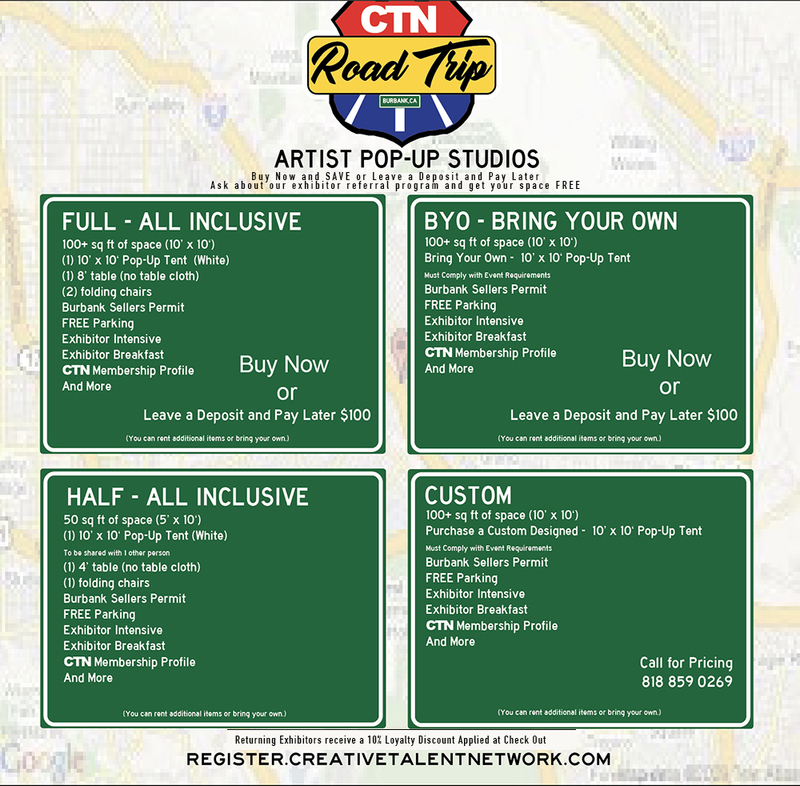 CTN ROAD TRIP is strictly for artists who are currently in or interested in being a part of the animation, visual efx and video game communities. Permits: Merchant Permit by April 15th, 2019. CLICK HERE STATE Requirements: All vendors must have a temporary or permanent CA seller’s permit by the time you vend with us. See CALIFORNIA BOARD OF EQUALIZATION WEBSITE for more information. We ask that all new exhibitors be reviewed prior to being accepted. The Creative Talent Network is an exclusive top talent community and we hope you understand and appreciate our efforts in creating an event experience that is both memorable and enjoyable for everyone as we reserve the right to refuse applications. If you are not accepted you will receive a 100% refund minus a $25 application FEE. Load In: Artists can drive up to load in beginning at 7:30am Saturday. All artists must be set up by 10:30am. No artist may park on-site. There will be load in helpers available. You can ENTER and drive in through the Magnolia Blvd entrance ONLY and pull in front of your booth to unload only. Please leave as much room in the center of the street for others to drive in. Once unloaded immediately remove your car and exit through the Orange Grove Avenue EXIT. And then come back and set up. All vehicles must be off the street by 10:30am. You must be completely set up and ready to open by 11:00am. Load out: All Exhibitors must load out by 9:00pm Sunday evening. The City of Burbank will have 2 police officers that patrol the area in the evening, and two Downtown Burbank Ambassadors that will be in the area from 4pm-12am on Saturday, and 12am-8am on Sunday. CTN is also providing additional overnight security through Champion Security with one guard dedicated to our block from 4pm on Saturday - 8am on Sunday. Please stow your items under your table or bring table cloths or sheets to cover your items at night. Although we are providing many security options we highly recommend all exhibitors take any expensive or rare items with them Saturday night when they close up for the evening. You can use the restrooms located inside restaurants and the mall when they open. Sign up with your email address to receive newsletter updates.